People who live in the Northern part of Metro Manila are so lucky because a lot of milk tea places are located there. 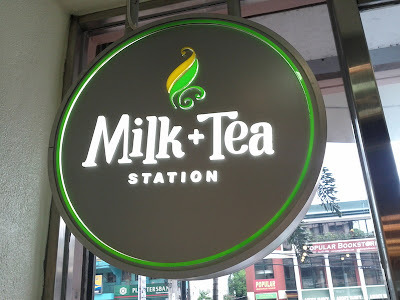 I told myself that I'd check out the milk tea place at Imperial Palace Suites which I spotted on the way to a meeting. I finally got the chance to check it out when I arrived in the area 30 minutes before my appointment. I probably had a silly smile on my face when I entered the shop. After ordering I immediately whipped out my phone and asked permission from the crew if I could take some photos for my blog. They, of course, obliged when I said I had a tea blog. I probably weirded them out though since I also took a photo of the cup when they served it hehehe. 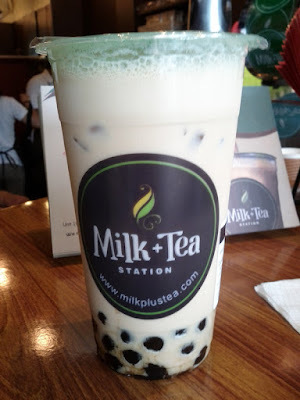 Anyway, so I just ordered for a standard glass of milk tea with pearls. It did not disappoint and I'm pretty sure I'll drop by again when I visit QC. I'm such a milk tea addict, I asked my Mom to get me some in Jakarta I can sample. It was my sister-in-law who took up my request and she's so far brought home two different brands for me. The latest pasalubong she brought me is Gold Roast Teh Tarik. 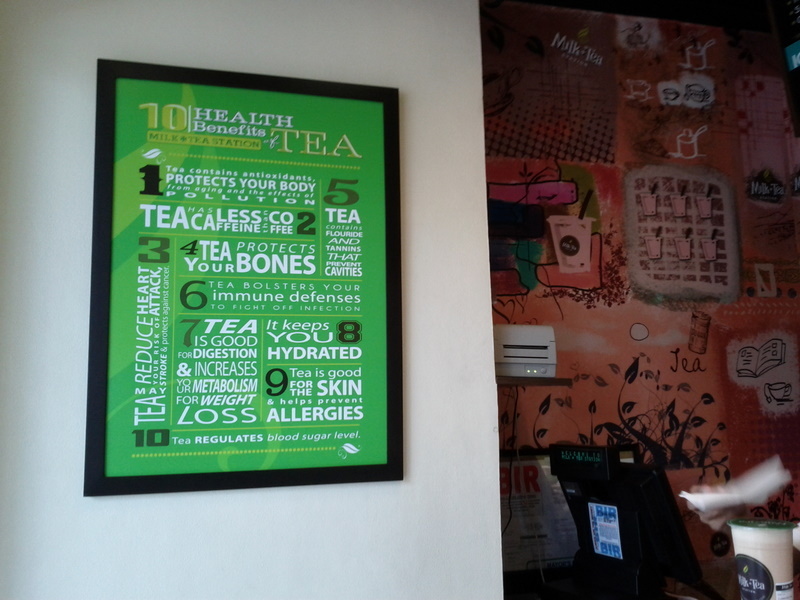 I had just finished the second pack of my now-favorite instant milk tea (which I haven't even blogged about yet! ), but I instantly fell in love with Gold Roast Teh Tarik. I just tried it on Easter Sunday and I think I'm already half-way through the pack. Oh noes! Anyway, what I try to do is compare the taste of the instant milk tea to the bus terminal in Singapore teh tarik which Drew and I really liked. And so far Gold Roast Teh Tarik is the closest to it! It's just right because it isn't too sweet, the tea isn't bitter and it doesn't have a citrus after-taste. I hope I can find some here locally. Whenever I'm in Singapore I go to 7-Eleven to check out if there's anything new I should try out. I had sampled the Pokka Milk Tea last year and found it a tad too lemon-y for my taste, but that didn't stop me from drinking it every time I visited Singapore. Anyway, so during my visit last month I was surprised to see a new offering by Pokka - Milk Green Tea. Green tea with milk? Green colored beverage? I had to go around 7-Eleven's aisles thrice, thinking whether I should sample it or not. I was apprehensive because I thought that green tea plus milk would be weird. I like drinking green tea as it is, the more bitter, the better. So my curiosity won out and I got a bottle. My hotel was just a stone's throw away so I went back to my room to get some rest and sample the green tea with milk. And, my oh my, I got the shock of my life. It was an awesome experience. I never expected that green tea would go so well with milk. 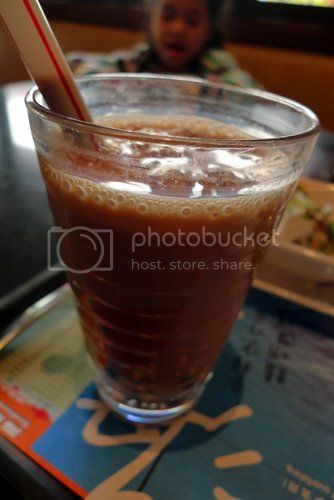 I loved it because it had the right level of sweetness and drinking it made me feel refreshed and re-energized (I had just come in from Manila that day and took a long walk to the Singapore Philatelic Museum). Dear local retailers/supermarkets/specialty shops, please, please import Pokka Milk Green Tea!!! In a recent trip to Hong Kong, my brother's family and I visited Ocean Park a day after a hectic New Year's celebration. The park was a far cry from what I recall during my last visit a decade ago. I was pleasantly surprised by how it's become this sprawling, full-fledged theme park. We arrived at noontime, and boy were we famished. 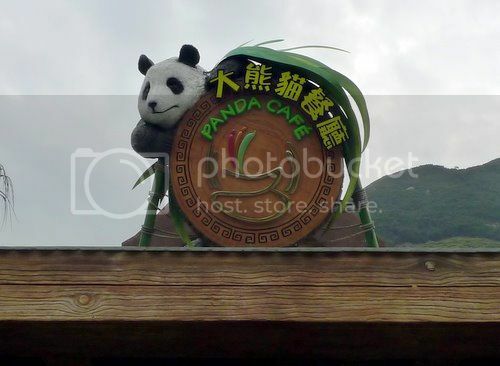 A restaurant, the Panda Cafe, was a stone's throw away from the park entrance. They served typical Chinese food, but what really caught my attention was their iced milk tea, naturally! The milk tea was dark and slightly creamy, with a lot of bite to it. I like that it's bitter and not too sweet. Even my brother and his wife were in agreement. I wanted another glass, but alas, I have to stick to my one-glass-a-day limit. I love that anywhere I go, Hong Kong serves a mean iced milk tea. I'll be back soon!